Jeanette & I have been leading a Bible study with college students in Tandi since last November. This modest group of 3 students has been a tremendous encouragement because it is so clear to us that these young people will be used by God to love, serve & inspire others. They certainly have that effect on us, and we are reminded time & time again that what matters the most is “Christ in us”. We are a new creation & will continue to make spiritual progress because of “Christ in us”. We can serve & give glory to God because of “Christ in us”. We can overcome trials & obstacles that are far greater than us because of “Christ in us”. “Christ in us” doesn’t mean that we are exempt from trials & situations we don’t understand, but it does mean that God is working in us to purify & refine the person that we are. We lose sight of ourselves and are able to think of others. This is possible because of the beauty of our Lord Jesus Christ who lives within us. This is Jeanette and my hope and prayer. That “Christ in us” might show in even the small tasks of our everyday lives so that more Taiwanese may be drawn to curiosity and eventually drawn to Him. 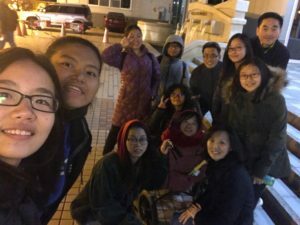 Please pray with us that we may be able to witness more and more people of Taiwan open the door of their heart to Christ & receive Him as their Savior & Lord.